Tonight I decided the women in the Witherington family needed to get out of the house for a while. We have been working hard the last few days, playing hostess to visiting friends and family in the aftermath of my Daddy's death. I wanted to go somewhere nice, but comfortable. And I wanted insanely good food. Boy, did I ever get what I asked for. After much thought, I took my Momma and my niece-in-law, Sarah, to Blue Turtle Bistro. Jim, a friend of mine, is the manager, and I haven't been able to stop in during my last few visits home. Plus- I was a little afraid of going and not liking it- considering my friendship with Jim. I was such a silly goose for letting that keep me away! We came in for an early dinner- in fact, we were the first ones there for dinner service that night. We were seated immediately (after a quick hug from Jim) and we ordered dinner drinks. I had a Reisling from the Washington state area, I don't remember the label, but it was very good. It went perfectly with the Brie En Croute (served with sliced apples, strawberries and a wonderful macerated cherry compotish mixture). When it came time to order entrees, I was honestly stumped. Everything sounded so wonderful! Momma and Sarah both ordered the beef fillet. It was served with haricovert and silky mashed potatoes. 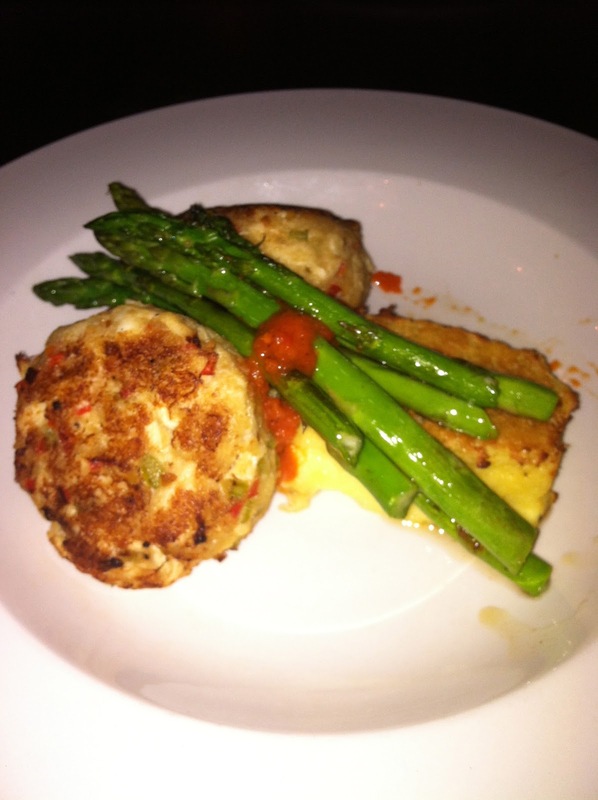 I ordered the crab cakes (on the recommendation of our server- bless her!). They were served with a roasted corn pudding and asparagus. The crab cakes were packed with crab- very little filler (which, of course, is the true test of a good crab cake). They were so rich, I could only eat one! That might have been because I had a hunch dessert was not to be missed. I was so right! But I have to mention the roasted corn pudding before I leave dinner. The outside was slightly crispy and the inside was achingly creamy. The flavor of the corn was definitely out front- but the texture is what made the dish for me. The combination of the strong corn flavor with the crab cake was one of the most divine culinary things I have ever experienced. Jim ever so sneakily pushed the dessert menu my way as we were finishing the last of our dinner. Again, I could have ordered anything on the menu and been very happy. Sarah ordered the pumpkin/gingerbread creme brulee- served with pistachio brittle (to me the best part). Momma and I split the bread pudding. It was topped with slightly sweetened whipped cream, butterscotch sauce and more of the macerated cherries. Jim added a sparkler, for a dramatic touch. I am telling you now- the combination of the sweet bread pudding with the salty butterscotch sauce was completely out of this world. 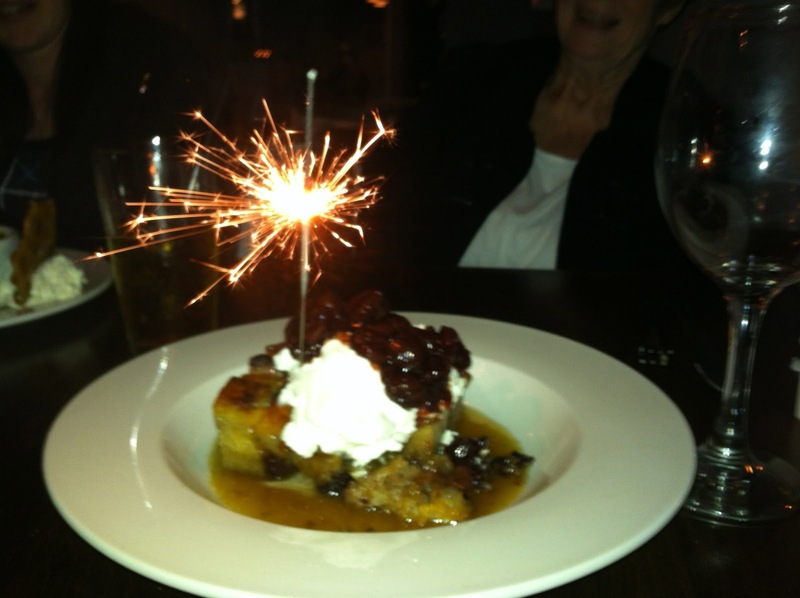 It truly was the best bread pudding I have ever eaten. Ever. Seriously. And believe me- I have eaten my share of bread pudding. As I read this before publishing it, I noticed I used the word "combination" quite a bit. As a writing teacher, this irks me. But as a foodie, it makes me realize just how important unity is on a plate. Good restaurants make sure each individual dish is the best it can be. 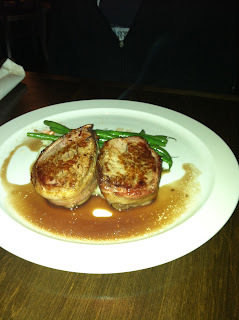 Great restaurants put thought in how the flavors on the plate go together throughout the meal. I can honestly say Blue Turtle is a great restaurant. From the appetizer to the dessert, every bite was consistently amazing. I don't get back to Savannah as often as I'd like, but after tonight, Blue Turtle will be on my "must have" list for every single return trip. If you love food (and stellar service) you MUST go give Blue Turtle a try. I promise you won't be sorry!